RATES (1 WEEK) 2019 View our full early bird rates | Refer & save! -Financing is available in up to five monthly payments; payments must be completed by September (more info); view our recommended checklist. Up to three hours of instructional tennis per day from the TSPA pros (better known as the Dream Team!) More info. Please note our new Tennis Max program at the CSL Tennis Club is a high performance tennis camp which has up to six hours of tennis per day on clay courts with smaller ratios. More info. Three one hour tennis lessons for FREE from the middle of May until the end of June for those who register for at least one week of camp (more info). Before care (as early as 7am (by reserving only)) and after care (up until 6pm) available known as our Chill Zone. Outings (read them all) such as Park Safari July 2, 2019, La Ronde on week 5 July 23, 2019, the Mont-Saint-Sauveur Water Slides on week 3 (more info) on July 9, 2019 and the Rogers Cup on week 7 (more info) August 6, 2019. Free pizza on Friday, and sometimes, freezies when very hot. 1) For NEW clients: Click the image register → If the camp registration does not work due to system issues, we have a back-up registration that can be accessed by clicking here. 2) For existing clients: enter your email and password at the top of the page and click Login. Then, follow the steps to register for camp. 8:00 - 9:00 Check in at the Caldwell Tennis Courts: 5785 Parkhaven. In case of inclement weather, check in at 5794 Parkhaven (the Aquatic Community Centre) in the gym *. * Please see our home page for updated check-out location. Early check-in / late checkout fee: $12 per day or maximum $30 per week per session. Registration required. In inclement weather, pick-up (check-out) will be at Wagar High School via Door B in the back of the school until 4pm, and at the Aquatic & Community Centre (ACC) from 4:30pm until 6pm. 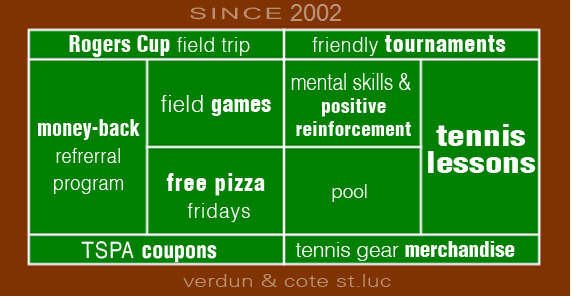 Note: Campers will remain at the Caldwell Tennis Courts in case of bad weather in the morning (we make up a decision by 1pm) and on the following dates: The week of July 29th to August 2nd due to the Sam Bruemmer Tournament taking place at the Côte Saint-Luc Tennis Club and the week of August 19 - 23rd due to the Senior National Tournament taking place at the Club. Also, the TSPA T-shirt is the required uniform. * Campers will remain at the CSL Tennis Club all day unless it rains. Please see our home page for updated check-out location. Early check-in / late checkout fee: $12 per day or maximum $30 per week per session. Registration required. ** In the case of inclement weather, drop-off is at the Wagar High School (5785 Parkhaven). Use entrance door #2 in the back of the school. Visit the home page for the most updated info. Being the #1 recreational tennis camp in the City certainly has many other questions and information that we simply cannot put all here. Visit our FAQ (frequently asked questions) section to answer all your other questions such as uniform, coupons and so many others by clicking here. You may claim up to $500 paid for camp fees per child less than 16 years old paid by parents to register a child in our camp which promotes a healthy and physical lifestyle. The amount a person receives back comes out to approximately 15.5%. On the provincial side, you can get back 26-60% (up to $4000 per child paid in camp fees back in tax credits depending on your family income). More info.